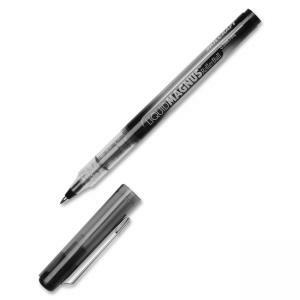 Liquid Magnus rollerball pens contain water-resistant, fade-resistant, acid-free, liquid pigmented ink for the exceptionally smooth writing experience of a gel pen combined with the strength and durability of a ballpoint pen. Rollerball pens are designed for precise writing, even through carbon copies, and write clean, distinct lines. Visible ink supply helps monitor ink levels. Color-coded cap includes flat metal clip.